I learned to appreciate French food living in Europe for six years. 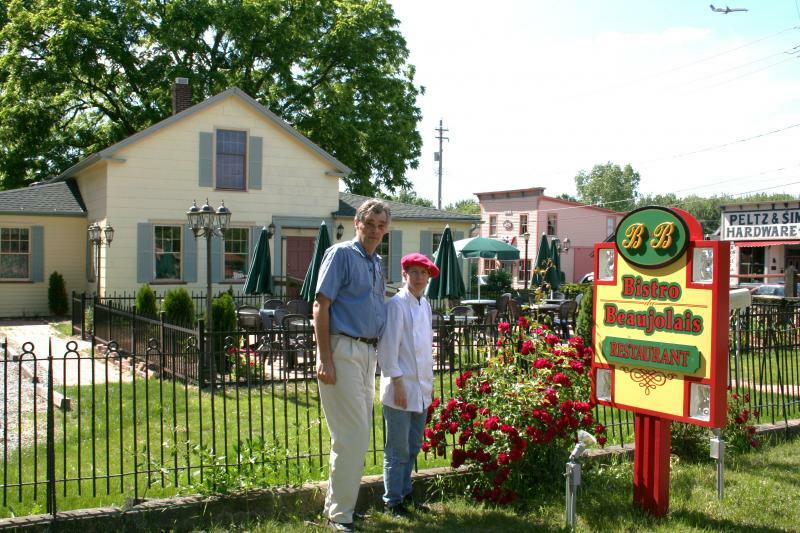 Le Bistro du Beaujolais is a charming little French restaurant located on the corner of Columbia Road and Mill Street on the edge of Grand Pacific Junction in the heart of my hometown, Olmsted Falls. I only wish this restaurant had existed then, but then again we didn’t go out to eat very often and when we did we went to Nam Wah in Berea. I apologize in advance for the darkness of some of the pictures. I did not want to disturb the other diners with a flash. The owners Georges and Claudie D’Arras are welcoming, and the food is delicious. Georges is an absolutely charming and gregarious host, while his wife Claudie oversees the kitchen. The location burned down in 2009, and they worked to meticulously recreate the restaurant. The original 1830 house, designated a historic landmark, was restored in ten months and looks almost exactly as it did before. 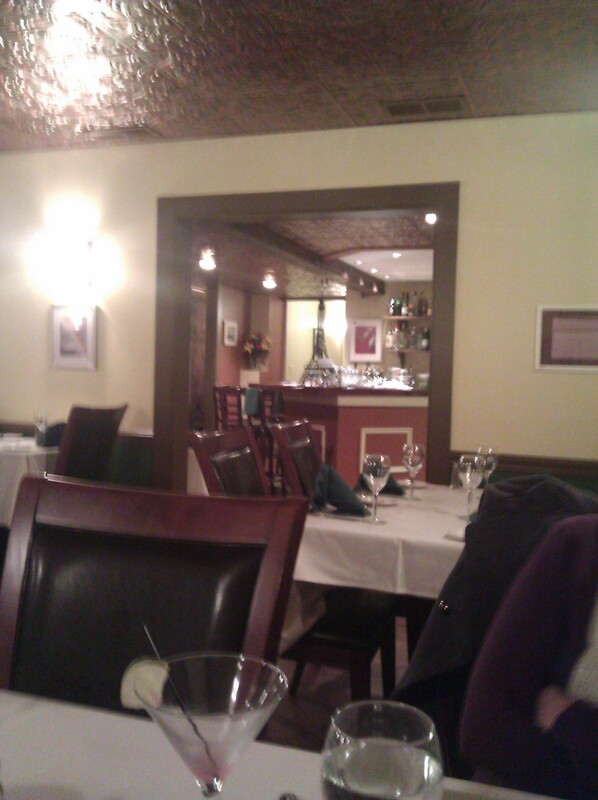 The restaurant features two cozy rooms as well as a lovely outdoor patio. I particularly love the light fixtures, which are whimsical music holders. 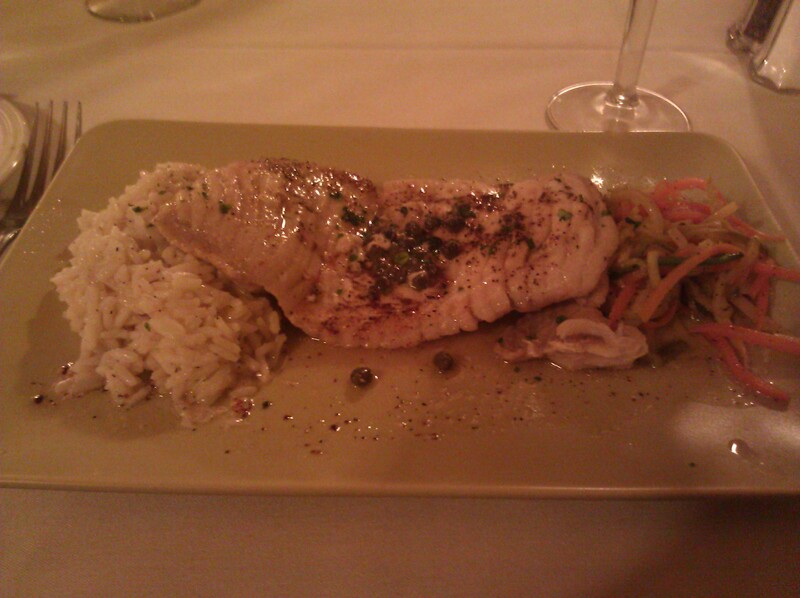 Their 3-course prix fixe menu offers a variety of choices at a reasonable price of $27. You have your choice between 3 starters, 3 entrees and a dessert. I have ordered this in the past and been very happy with my choice. I have also thoroughly enjoyed their vegetarian offerings, including the most delicious vegetarian roll-up dish featuring lentils I have ever eaten. I liked it so much I was back within a week to order it again – and I live on the East Side of Cleveland. It’s worth the drive. I met a friend here recently to celebrate her birthday. 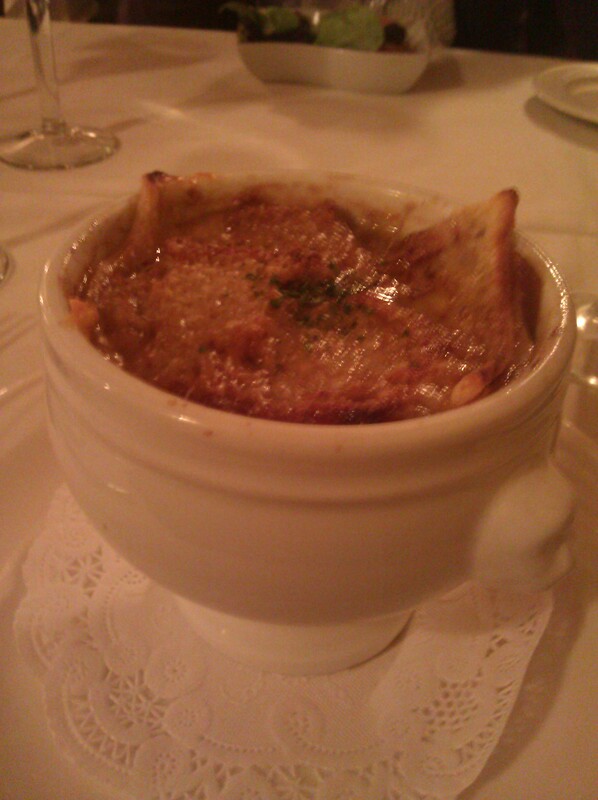 I decided to splurge and ordered a la carte because I wanted their French onion soup. It was well-seasoned, the onions were nicely caramelized, and the cheese was sufficiently melty and gooey. Just as a good French onion soup should be. One of my favorite entrees on the menu is probably something you have never heard of – the baked skate wing (Alle de Raie Sauce à la Compote d’Échalotes). Skate is type of Ray (its appearance is similar to a stingray). Despite being a cartilaginous fish it is not at all fishy. I would have never tried it if Georges hadn’t brought one out for us to try the first time I dined here with my dining out group. It is served topped with a delicate shallot and butter sauce over rice and simply melts in your mouth. I am a HUGE fan. You simply have to taste it to appreciate it. 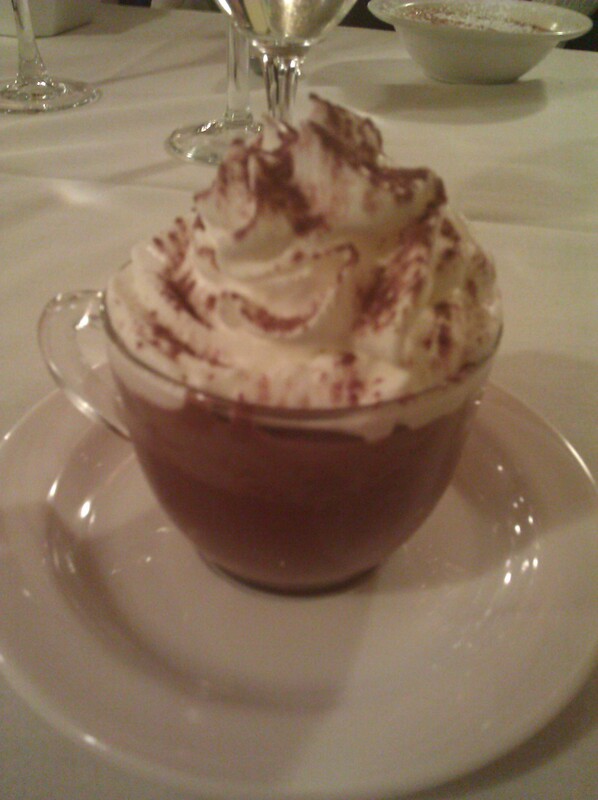 I finished my meal with a dense and rich mousse au chocolat. As you can see from the photo the portion was generous (served in a clear tea cup) and topped with real whipped cream and chocolate powder. As a true French bistro, they serve only French wines. The staff can help you choose the perfect wine with your meal. Since they only serve French wines they can serve by the glass while maintaining a wide range of inventory at a great value. Word to the wise: if they have coq au vin on special, order it. You won’t regret it.